With chassis rave hooks that boast capacities of up to 10 tonnes, our range of ratchet strap fittings is the definition of strength and practicality. We sell chassis rave hooks of as much as 75mm in width, with the addition of a welded bar making our rave hooks even safer. For lashing heavy loads in a road transport context, rave hooks can be the most useful ratchet strap fittings on the market. They can be quite a bit wider than our claw hooks and so can accommodate webbing of various sizes and capacities. Our rave hooks also fall into this category, offering the aforementioned advantage of having an extra bar of metal wire secured between the two sides. This keeps the entire assembly more stable and resilient over time, making sure that even the most sizable types of cargo can be fastened in place during transit without the risk of toppling. Finally you can specify closed chassis rave hooks which are designed for the kinds of applications that require class-leading levels of strength and resilience. Because we make custom ratchet strap for our customers, you can choose to add chassis hook products to an entire assembly if you wish. Alternatively, you can buy replacement chassis hooks to repair your existing setup. 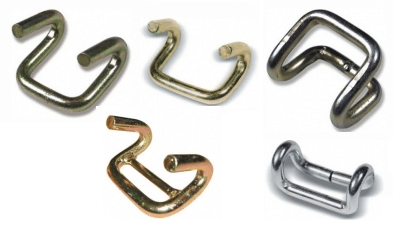 Take a look at our full hook selection to find other varieties. Do not let your question about our chassis hooks burn away in your brain unanswered. Call our knowledgeable team on 01384 78004 to learn more about the ratchet strap fittings we sell. Email us if a phone conversation is not convenient. Rave Hooks Overall rating: 5 out of 5 based on 6 reviews.